Who imagined such a dramatic finale to 2017? The Thomas Fire, still burning at its northern perimeter in the Los Padres National Forest, is now California’s largest wildfire in recorded history, burning more than 280,000 acres and destroying over 1000 structures. 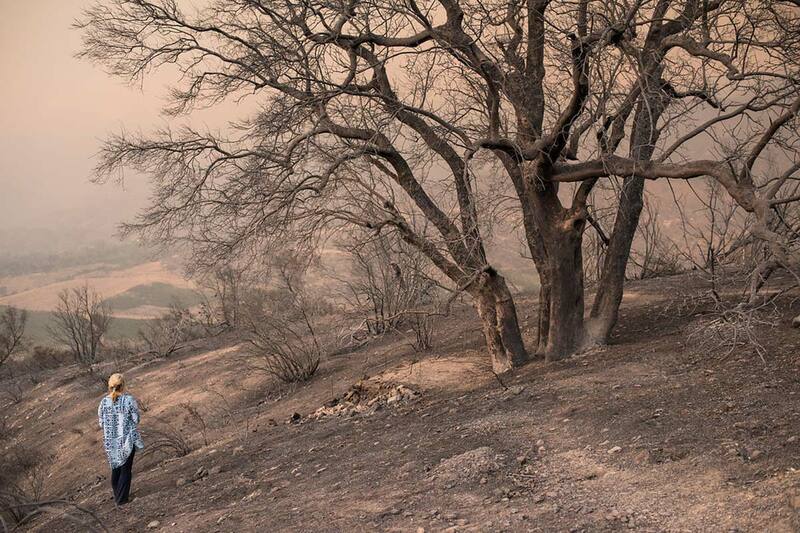 As the fire started only a few miles east of The Ojai Foundation, we were in the direct path of its initial fury. We are deeply grateful for the staff’s selfless sacrifice in those first hours–watering down trees and structures, turning off propane lines and packing up archives, files and computers–their eyes and hearts turned toward protecting the Foundation, as well as themselves, one another and precious few of their possessions. After several weeks of evacuation, we returned to Ojai on December 17th. Since then, we have spent a handful of days up on the land surveying and documenting the damage—doing no more than is immediately necessary as the air quality is still extremely unhealthful, especially with the burning oil seeps in the Upper Ojai Valley. A good portion of the work in the last days has been restoring the water lines (thanks to Brendan working to patch leaks and replace pipes), enabling us to finally water thirsty and parched trees and shrubs and to fill water bowls for the bunnies, deer and other critters. The fire has clearly pushed birds and other wildlife into the unscathed areas for food and cover. We have marveled at these signs of life amidst the devastation: the sound of birdsong, the mating calls of a Great Horned owl pair, track and sign of coyote, bobcat, and raccoon, among others, and the sight of many rabbits, chipmunks, and birds, forgoing their fear of humans to come to the water bowls. The human and more-than-human community remains strong, the listening practices are alive, and the heart of the land continues its pulse—what we need is here. Yet, on the human, business and infrastructure level, the lists of tasks are daunting and we are reminded daily of the immense amount of work to do. We are in for the long haul, with an image of re-opening set off in the distance. With almost an entirely different set of conditions on the land and tasks to be done, we have canceled all our land-based programs, and most regrettably, have laid off seven of our beloved and dedicated staff. In different ways, they each expressed their love for the community, their commitment to the mission, and their desire to return to the job if/when possible. We are committed to doing what we can to support them through this difficult transition. In the face of the challenges ahead, the Board of Directors agreed that Sharon Shay Sloan and Brendan Clarke stay on as co-executive stewards to lead the recovery effort. And our global community of supporters has come forward with infinite love, financial gifts, and offers to help with whatever is needed. While we are eager to put these willing volunteers to work on the land, we remain fully closed to the public until we have achieved a safe working environment, including hazardous waste removal with the county and state. One of the first items on our priority list is to begin land regeneration, rainwater capture and water retention earthworks. Large portions of the ridge and hillsides are now barren and exposed, providing a precious opportunity for sculpting water retaining swales, berms and basins before free running water generates destructive runoff, erosion, and mudslides. We plan to engage our community of supporters and eager helpers in this effort as soon as possible. Contact David Bryan at david@ojaifoundation.org to add your name and phone number to the volunteer list. Finally, we continue to need your financial support to help us through this initial phase of emergency clean up and recovery, with a goal to spend the next 4-6 months removing dead and damaged trees and debris and restoring the basic infrastructure (water, power, sanitation, camp kitchen)—in order to accommodate volunteer Days of Service and minimal in-house programming, while simultaneously working on longer term dreams, visions and plans: re-imagining The Ojai Foundation for our times. Please click HERE to donate to the FIRE RECOVERY FUND and help us navigate the unchartered waters ahead. Please also forward this newsletter and help spread the word. Again, we send all of you immense gratitude for your love and support. It has buoyed us all and helped us stay quiet in heart and in eye, clear and well-assured that what we need is here. *Special thanks to Bill and Eliza Moses for offering Casa Barranca to our staff for the last several weeks.